Douglas E. Smith's Lode Runner was introduced to Japan in 1983 on various popular Japanese home computer platforms, including the MSX, Sharp X1, and NEC PC family computers. Hudson Soft licensed the rights to bring the game to Nintendo's Famicom, and it was released in 1984 as one of the first 3rd party games ever made for the system and it was an incredible hit. Around the same time, Irem licensed the rights to produce an arcade version of Lode Runner which they also released in 1984, along with three other sequels through 1986. These arcade versions made a few tweaks to the original game play, and the final arcade game introduced a two player cooperative mode. 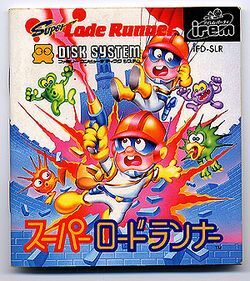 In 1987, Irem decided to package a number of select stages from all four of the arcade games into one title, and released it in disk format for the Famicom Disk System, entitled Super Lode Runner. Though the graphics were not quite as good as the arcade games, they were close, and Irem brought many of the game play changes to Famicom players, including the new two player mode. Irem released a sequel later on that same year. A different version of the game was released for the MSX with the same title.